The sky will welcome the new year with the amazing show of the Supermoon, the largest of 2018. Our satellite will reach its minimum distance from the Earth (perigee) next 1 Jan., at 21:56 UT, when it will be at 356565 km from us (compared to an average distance of about 384.000 km); a few hours later, the Moon will be also Full. Such a coincidence is now popularly referred to as “Supermoon”. The term itself is of no scientific value: astronomers prefer to call it perigee full Moon, but undoubtedly “Supermoon” is by far a much more charming name. The 3/4 Dec. 2017 Supermoon behind the lantern of the St. Peter’s Dome, at dawn. NB: la versione in Italiano è disponibile qui! Both the full and the new Moon can be “super”, as long as they occur near the lunar perigee, that is, when our satellite is at its minimum distance from the Earth. The Moon moves around our planet along an elliptical orbit, so its distance from us is not constant, but varies between a minimum (perigee) and a maximum value (apogee). Of course, the new Moon is not visible in the sky, so only the full “Supermoon” can be observed (unless we have a solar eclipse during the new Supermoon, as in March 2016). Next 1/2 Jan. Supermoon will be the second one of a cycle of three, which started last 3 Dec. and will end next 31 Jan. (when we will also have a lunar total eclipse). 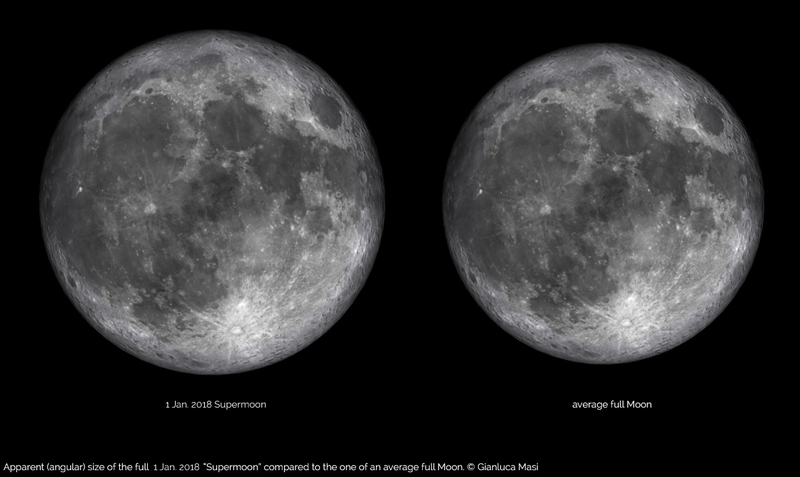 Next Supermoon will be the closest full Moon of 2018, being 1000km closer than last Dec. Supermoon, but the differences in brightness and apparent size of the lunar disk will be imperceptible. It is easy to record the largest apparent dimension of the Supermoon: a moderate, 200mm telephoto lens and a digital camera can be used to capture it and compare its disk dimension with that of an ordinary full Moon, grabbed with the very same equipment. 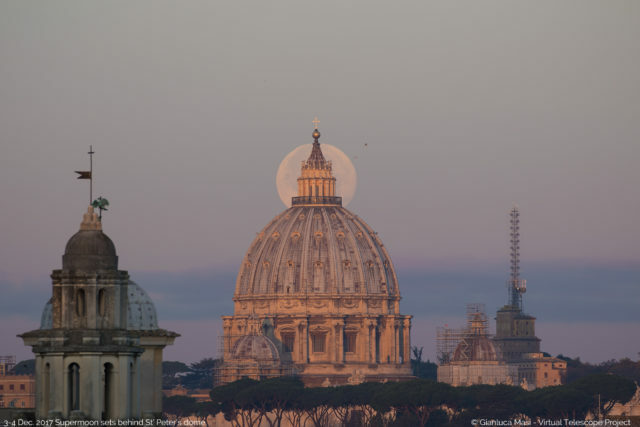 “This could be a nice experience”, says astrophysicist Gianluca Masi, “also because imaging the full Moon is as easy as shooting an ordinary panorama in broad daylight”. 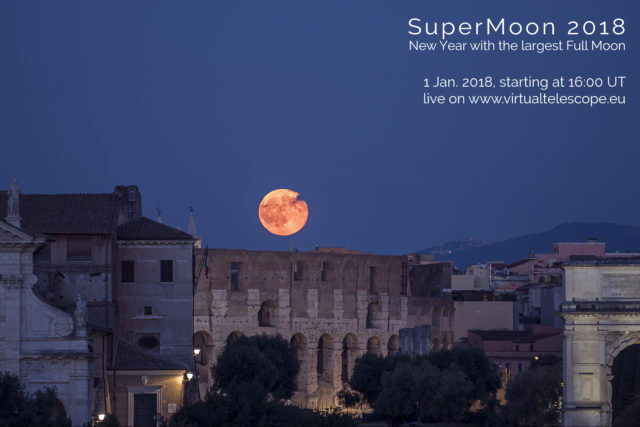 The Virtual Telescope, thanks to its roving instruments, will show the New Year Supermoon while it will rise above the legendary skyline of Rome, behind the most famous monuments of the Eternal City, with commentary by astrophysicist Gianluca Masi, sharing the experience with curious people from all around the world. A stunning start of the new year! Back to the “Upcoming Events” page..